England lost 1-0 to Belgium tonight to ensure they finish second in their group and play Colombia in the first knockout round. 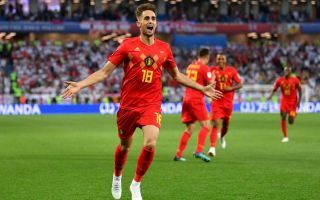 A superb goal from Adnan Januzaj settled the contest, with both teams rotating and resting star names for what was clearly seen as something of a dead rubber. While it would have been nice to see more from England, are fans justified in feeling so disappointed? Well, Januzaj may have been a bit rubbish for Manchester United and Sunderland, but this was a sublime strike to light up an otherwise dull game. No wonder some United fans are now calling for the club to bring him back – he surely can’t be any worse than Alexis Sanchez? The bad feeling coming out from that result has to be the worst thing of all. Going into this match full of confidence after two wins against Tunisia and Panama, England fans are now left dreading coming up against a Colombia side that aren’t even that special. we are on the better side of the draw but knowing England we will lose to Colombia anyway. How did this happen?? Moment of the tournament from Michy Batshuayi!